For more than a decade, the United Nations Development Program (UNDP) has annually published the important Human Development Report (hereafter the Report). The most consulted aspect of this widely used international report is the Human Development Index (HDI), which at its peak ranked 174 countries in the world, including Cuba, based on socio-economic indicators. Due to the severe crisis of the 1990s, Cuba’s HDI ranking fell from 61st to 89th place in the world, and from 9th to 12th place in Latin America. In two previous publications I pointed out that it was impossible to estimate the crucial economic indicator of the HDI for Cuba because of the lack of essential statistics. In the 1999 edition of the Report (based on 1997 data), there was a change in the methodology which resulted in Cuba jumping from 85th to 58th place in the world and from 11th to 9th in the region; moreover, in the 2000 edition, Cuba climbed to 56th and 6th places, respectively. This miraculous leap could not be justified given the incomplete process of economic recovery in the island. In the latest edition of the Report (2001), however, Cuba was partly excluded from the HDI due to the lack of reliable data. This paper follows the evolution of Cuba in the HDI: that nation’s ranking in the world and the region, identifies problems in the social indicators as well as in the problematic economic indicator, and explains how the miraculous jump occurred because of statistical inaccuracies and the methodology change. The most internationally used indicator to measure the development level of a country is its GDP, which annually estimates the value of all goods and services generated in the economy. To correct for inflation, GDP is adjusted with a consumer price index based on the price variations of a basket of the essential commodities and services. In order to properly compare GDP among countries with diverse populations, it is divided by the number of inhabitants to obtain GDP per capita. To address the problem of the diverse currencies that are used to measure national GDP and allow for international comparison, each nation’s GDP is converted to U.S. dollars, either based on the official exchange rate or according to the “purchasing power parities” (PPP) of currencies. The latter measures the diverse purchasing power of currencies based on the national prices of a large number of goods and services, comparing each of them with the corresponding prices in the United States in order to make the conversion to the dollar (“international dollar”). The World Bank, in its World Development Report, annually ranks all the countries of the world using their GDP per capita, adjusted for inflation and converted to U.S. dollars based on the official exchange rate and the PPP (hereafter GDP p/c PPP US$). Countries are classified in three groups: high, medium and low (the most recent edition is World Bank 2000/2001). In the decades of the 1960s and 1970s, the Bank included Cuba in its World Development Report. But at that time Cubans used the so-called “material product system” (MPS), typical of the USSR and socialist countries, while the rest of the world used the system of national accounts (SNA). The two accounting systems were not comparable for two reasons. On the one hand, the MPS counted many times the value of a product in its different stages of processing instead of counting only the “value added” at each stage of production or transformation as the SNA does. For instance, cotton is successively transformed into thread, fabric and clothing; the MPS counted the value of cotton four times, while the SNA only counted the value added at each stage of garment production. On the other hand, as a legacy of Karl Marx, the MPS excluded the value of all “non productive” services (not directly related to material production), such as education, health care, social security, defense, etc., underestimating the value of GDP (actually it was called “global social product,” GSP). This second distortion was not favorable for Cuba due to the importance of its social services and defense in GDP. Therefore, the MPS overestimated GDP for one set of reasons and underestimated it for another. At the beginning of the 1980s, the World Bank put together an international team of experts to evaluate the MPS in the socialists countries with the goal of converting MPS measures to the SNA, and make feasible a proper comparison of GDP in all countries— capitalist as well as socialist—included in its World Development Report. An extensive study of the Cuban case demonstrated that it was impossible to estimate its GDP due to the deficiencies noted above (Mesa- Lago and Pérez-López 1985). As a result, the World Bank excluded Cuba from its comparisons. The ranking of countries based solely on their GDP per capita presupposes that development is measured only with that single indicator. But let’s consider a country with a highly unequal income distribution, where the richest 10% of the population receives 40% of GDP, and the poorest 40%, just 10%. That country’s GDP per capita would be a deceptive average, since the income of a small minority of the population would be considerably above the national average, and the income of a large majority would be considerably below the average. Moreover, countries like Costa Rica, Cuba and Uruguay have reached higher standards in their social indicators (health care, education, social security) than in their GDP levels, while the opposite is true in other countries that have seriously neglected their social services despite significant GDP growth. In order to cope with the problem discussed above, the UNDP constructed the HDI, combining an economic indicator with two social indicators. The economic indicator is GDP p/c PPP US$, based on estimates by the World Bank and the International Comparative Program. The two social indicators are: (1) life expectancy at birth (to measure health standards); and (2) a combination of the adult literacy rate and the enrollment rates at primary, secondary and tertiary education (to measure educational levels). The values of the three indicators cannot be merged because they are expressed in different units: PPP dollars, years of life expectancy and percentages in education, respectively. In order to overcome this difficulty and interrelate the values of all countries, an index is estimated for each of the three indicators, with a maximum and a minimum value derived from all the countries included, hence, the index’s range is from 1 for the best to 0 for the worst. Each index contributes one-third to the HDI value, which is calculated by adding the three indices, and then dividing the result by three (equal weights). Based on the HDI, countries are classified in three groups (high, medium and low) and numerically ranked from the best performer (1, the highest) to the worst (174, the lowest). The HDI favors Cuba because the island has performed quite well in the social indicators (health care and education), which have double weight, compared with the economic indicator on which Cuba has not had a good performance and has a single weight. Of course, this also applies to other countries in the region, like Costa Rica and Uruguay, which, as pointed out above, have invested considerable resources in developing their social services. The crisis of the 1990s, however, not only caused a sharp decline in Cuba’s GDP, but also harmed several social indicators (Mesa-Lago 1998, 2000, 2001b). Table 1 shows Cuba’s rank in the HDI, among all countries in the world and among Latin American countries. The first column of the table indicates the publication year, and the second column, the information year of the HDI.3 In 1989, before the crisis, Cuba occupied the 61st place among 160 countries in the world, and the 9th place among the 20 Latin American countries. In 1991, when the economic crisis began, Cuba fell to the 89th place among 174 countries, and to the 12th place in the region. Even though the crisis worsened in 1992 and 1993, Cuba climbed, according to the HDI, to the 72nd and 79th places in the world, and the 11th in the region. In 1994, the decline of Cuba’s GDP stopped, and in 1995 Cuba began a slight economic recovery, prompted by modest market-oriented reforms initiated in 1993. However, the HDI had Cuba falling to the 85th/86th places in the world, and remaining in the 11th place in the region. During the decade of 1990s, Cuba’s GDP growth rate peaked in 1996, but there is not HDI for that year.4 In 1997-1998 Cuban economic growth decelerated but nevertheless, in 1997, Cuba’s HDI jumped to 58th place in the world and to 9th place in the region, and in 1998 to 56th and 6th places, respectively. (It should be noted, nevertheless, that the values of the HDI and ranking before and after 1997 are not technically comparable due to a change in methodology, as will be explained in detail later). 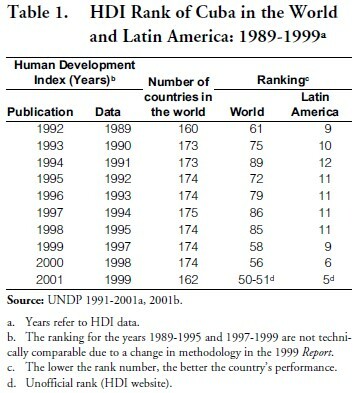 Cuba’s HDI ranking in 1998 was significantly higher than in 1989. However, in 1998 Cuba’s GDP was still 33% below the 1989 level, and a similar pattern applied to production of goods and services, with very few exceptions (Mesa-Lago 2001b). How did this miraculous jump occur? In order to explain that phenomenon it is necessary to analyze the three indicators that comprise the HDI. • for 1995-1999, it showed a slight increase from 75.7 to 75.8. For 1995 and 1997 the figure was the same (75.7)5 and this indicator index (for Cuba related to all the countries) remained unchanged at 0.84 (UNDP 1991-2000). This last point confirms that this indicator cannot explain the 1997 miraculous jump. The Human Development Report Office in New York (HDRO 2002) disagreed with my conclusion for the following reasons: (1) “it is not correct to compare data estimated with refined methodologies;” (2) “lack of data for Cuba didn’t allow enough adjustment through the years,” and (3) “fluctuations is not a sign of data contradiction neither of doubt upon their accuracy.” I do agree with the last comment but my analysis shows significant contradiction in HDI estimates for 1992, and the most important point (not addressed by the HDRO) is that there was no increase of life expectancy in 1995-1997 hence this indicator could not explain Cuba’s jump in the HDI value for 1997. Actually a comparison of the years 1995 and 1997 done in the 1999 Report showed a decline of 2 points between these years (UNDP 1999: 165). The second indicator—which contributes another third of the HDI value—is education. This indicator combines two variables, the first of which is the adult literacy rate (population older than 15 years); this variable contributes two thirds of the value of the education indicator. In the 1990s, Cuba ranked third in the region (after Uruguay and Argentina) on this variable and yet, only about 4% of the population is illiterate and it is very difficult to reduce this level, particularly in single years. For the year 1985 the HDI rating for Cuba was 96% later reduced to 92.4%; based on the first figure there was stagnation by 1998 (96.4%) but based on the second figure there was an increase (deterioration) of 4 percentage points. Since 1990 (94%) there was constant growth in this variable, but the increase in 1995-1997 was only two tenths of a percentage point: from 95.7% to 95.9% (UNDP 1990-1999), which does not seem to explain Cuba’s great leap forward in 1997. The HDRO (2002) repeated the first argument summarized on the life expectancy indicator but, once again, did not address the major point: the minute increase in literacy in 1995-1997 could not explain the jump of Cuba in the HDI in 1997. (The comparison between 1995 and 1997 showed no change in these years; UNDP 1999: 165). The second variable of the education indicator is the percentage of school-age population enrolled in the three educational levels (see first three columns of Table 2). In Cuba, elementary instruction was already available to the whole population since the end of the 1960s and, based on official data the gross enrollment rate was 100% in 1989.6 Since 1990-1991, however, that rate began to decrease and was 99.3% in 1992 and 99.1% in 1999 (ONE 1998, 2000). According to UNESCO (2001), Cuba reached the highest percentage of coverage at the secondary level in 1989 with 90.2%, then decreased to 74.5% in 1994 and increased to 80% in 1996-1997, still 10 percentage points below the 1989 level.7 Enrollment in higher education dropped 56% in 1989-1999 (CEE 1991, ONE 2000); the gross rate was 20.5% in 1989 (21.8% in 1987; UNESCO 2001) and declined to 12.4% in 1996-1997 (this continuing decline is acknowledged by CIEM 2000). Given that primary and higher education gross enrollment rates fell almost without interruption in 1989-1997, and that the rate of secondary education in 1997 was well below the 1989 level, the combined rate of the three levels must have fallen in that period. In summary, the health care indicator (life expectancy) shows remarkable contradictions that raise doubts about its reliability. Within the education indicator, the literacy variable is rather consistent but cannot explain Cuba’s miraculous jump in the HDI ranking in 1997. Finally, the combined enrollment rate data used in the HDI for the three educational levels conflicts with the official figures from Cuba and UNESCO. The economic indicator, which contributes one third to the HDI, is the GDP p/c PPP US$. It is the most complex and difficult to analyze. In 1995 Cuba shifted from the MPS to the SNA, and began publishing GDP adjusted by inflation (with 1981 as the base year) going back to 1985, so that there is a GDP series for 1989-2000. This change corrected some of the explained problems of the MPS (overestimation, underestimation and impossibility of connecting diverse series), but did not solve the adjustment to inflation and the conversion to PPP dollars. Cuba’s two main statistical agencies (ONE and BCC) have never released information about the way GDP is adjusted to inflation, including the methodology for the elaboration of the consumer price index (CPI), the GDP deflator, the basket of goods and services used to measure inflation, and the weights assigned to price changes of the latter. In addition, after two decades, the year 1981 is still used as the base for the series of GDP in constant prices, in spite of the criticisms made about the anomaly of that year, and the universal practice of periodically updating the base year.9 Moreover, in 1992-1994 inflation escalated (reaching a historical record of 25.7% in 1993), which might have affected the series. Last but not least, the adjustment does not take into account the very high prices of goods sold in state dollar shops, parallel official markets, free agricultural markets and black market. According to a Cuban estimate, the CPI increased 1,552% in those markets in 1989-1993 (CIEM 2000) and therefore inflation must have been much higher than the official estimates. With regard to the conversion from peso to dollars, Cuba’s official exchange rate is one peso for one dollar, but the exchange rate in the black market reached 95 pesos for one dollar in 1994, while the state exchange agencies (CADECA) established in 1995 paid 32 pesos for one dollar in that year and 21 pesos in 1998 (see Table 3, last column). The worst problem is how to calculate the purchasing power parity (PPP) of the peso, since Cuba does not publish the statistics that are necessary to estimate such value. It should be noted that Investigación sobre desarrollo humano y equidad en Cuba 1999, a long and impressive study on human development made in Cuba under UNDP sponsorship, simply reproduced the HDI figures, and did not explain how Cuba’s GDP p/c PPP US$ was estimated (CIEM 2000). In conclusion, based on the discussion above and my experience accumulated over 40 years of studying and analyzing Cuban statistics (see Mesa-Lago 2001a), I believe that it is impossible to estimate Cuba’s GDP p/c PPP US$. So, how did the HDI calculate it? The HDI shows a decline in the economic indicator of 20% in 1989-1991, corresponding to the economic crisis, but an increase of 71% in 1992 when the crisis was worsening, as well as a decrease of 12% in 1993 when the crisis reached its worst point. 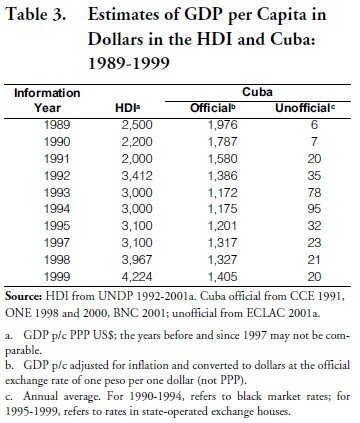 For 1989-1993 the HDI figures indicate an increase (improvement) of 20%, while the Cuban figures indicate a decrease of 41%. 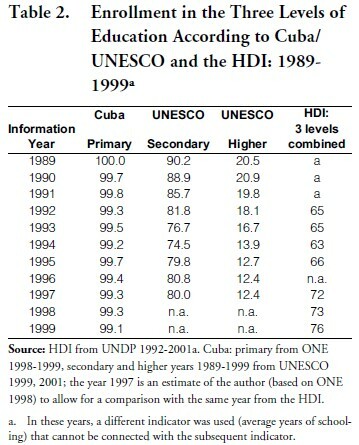 For 1993 the Cuban figure was 61% lower than the HDI figure. In 1989-1999, according to the HDI, there was an increase of 69% in the economic indicator but, based on Cuban data, there was a decrease of 29%. For 1999, Cuba’s figure was 67% lower than the HDI figure. All previous Cuban figures are based on the official exchange rate. Although is not technically appropriate to estimate Cuba’s GDP based on the unofficial exchange rate, it is obvious that if that conversion were made, GDP would be substantially lower than if based on the official exchange rate of one peso equal to one dollar. The last column of Table 3 shows the unofficial exchange rate, which differs significantly from the official rate. Could the differences between the HDI and the Cuban data be explained based on the purchasing power parity (PPP) of the peso? Leaving aside that currently it is impossible to estimate Cuba’s PPP, in my opinion the answer to that question is negative, due to three reasons: (1) the large gap between both figures; (2) the depreciation of the peso vis-à-vis the dollar (at the unofficial exchange); and (3) the loss of purchasing power of the pesos due to high inflation. The Cuban Central Bank argued in 1996, however, that the value of the free social services provided to the population (health care, education, social security) combined with subsidized prices of rationed goods equaled 50% of the monetary value of GDP. If we accept this argument for the sake of the comparison, GDP would be 2,108 in 1999 at the official exchange rate, that is, half the HDI figure. • the estimates presented by Summers and Heston refer to the period 1970-1988, when Cuba used the MPS instead of the SNA, which makes even more difficult the estimation (these problems were noted in Mesa-Lago 1998). In the 1996 edition, the corresponding footnote in the Report gave as a source for the GDP p/c PPP US$: the World Bank, World Bank Atlas 1995 (Washington D.C., 1994:18-19). This source, however, did not show a figure for Cuba in the referenced table; a footnote, however, gave a broad range of between $696 and $2,785. The HDI settled for $3,000, that is, a figure outside the range but arguably the result of rounding upward the figure at the top of the range, but it does not explain how that was done.13 In the 1997 edition, the explanation given in the footnote was the same as in 1995. The 1998 and 1999 editions gave as general source “calculated on the basis of estimates from World Bank” (1997 and 1999 respectively) but excluded Cuba with the following footnote: “Human Development Report Office estimates” (UNDP 1998:129-130; 1999:135- 137). In those two years it was decided by the HDRO not to give an external source and take the responsibility for the estimate, but without explaining how it was done. This was revealed in the 2000 edition, where a specific note said: “As GDP per capita (PPP US$) is not available for Cuba, the sub-regional weighted average of the Caribbean was used” (UNDP 2000:160). Not only the average used is absurd because of the differences between Cuba and the rest of the Caribbean, but also it is not specified which countries were included in the estimate. In 1998, five Englishspeaking Caribbean countries (Bahamas, Barbados, Saint Kitts and Nevis, Antigua and Barbuda, and Trinidad and Tobago) had a GDP p/c PPP US$ that ranged from 12,000 to 7,500, which situated them in the high or medium superior groups of the HDI, and, therefore, much higher than Cuba’s 3,967. Moreover, six other countries of this group (Suriname, Dominica, Grenada, Belize, Saint Vincent and Saint Lucia) had a GDP p/c PPP US$ higher than Cuba’s (from 5,161 to 4,566), and only two had a slightly lower GDP p/c PPP US$: Guyana (3,403) and Jamaica (3,389). The Dominican Republic also had a GDP p/c PPP US$ higher than Cuba’s (4,589) and only Haiti, the poorest country in the region and the only one in the lowest group, had a GDP p/c PPP US$ lower than Cuba’s (1,389). The arithmetic average of the GDP for these 15 countries was 6,586, that is, 66% higher than the estimate for Cuba. The HDI used a weighted average, probably based on the population size of the countries, to make the 3,967 estimate for Cuba. This average resulted from the fact that almost all of the Caribbean countries have very small populations (from 38,000 to 307,000 inhabitants), except three: Jamaica (2.6 million), Haiti (8.4 million) and Dominican Republic (8.5 million), so that the higher relative weight of these three countries determined to a great extent the “Caribbean” average that was used to impute a value for Cuba. Summing up, the doubts about the two social indicators explained in the previous section paled compared to the problems with the economic indicator, and both discussions demonstrate that Cuba’s HDI has been estimated in a faulty manner. Perhaps as a result of the shortcomings analyzed in the previous two sections, the 2001 edition of the Report excluded Cuba (together with 11 other countries) from the HDI master table, as well as from other key tables, due to the “lack of reliable data.” Table 28 of the Report included Cuba in “Basic Indicators for other UN Member Countries” not included in the master and other tables, and gave ten social indicators, excluding GDP p/c PPP US$. 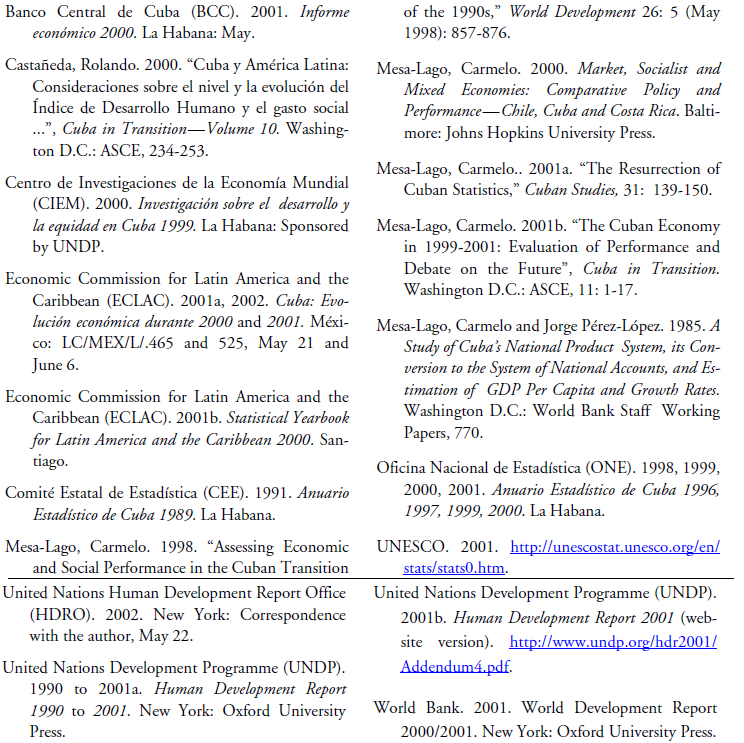 The website version of the Report also provided in one table in an addendum, socioeconomic statistics on Cuba and the other countries excluded from the HDI, but warned that these data “may be of varying quality and may not be directly comparable to those presented in the Report” (UNDP 2001b; this statement does not appear in the printed version UNDP 2001a). The addendum table did not show the GDP p/c PPP US$ either, but a footnote stated that “the Human Development Report Office estimate of the sub-regional weighted average of the Caribbean of $2,224(PPP US$) was used.” Based on those indicators, the HDRO then proceeded to calculate Cuba’s HDI and ranked that country between the 50th and the 51st places in the world (UNDP 2001b, website version), although Cuba and its ranking were excluded in the master table. This implied another advance in relation to 1998, and unofficially ranked Cuba in fifth place in Latin America. Surprisingly, all this information did not appear in the printed version of the Report. After more than a decade, the Report acknowledges that Cuba’s GDP p/c PPP US$ “is not available” and that its estimate is not comparable with data for the countries included in the HDI. This is done, however, for the years 1998-1999, when Cuba was already publishing extensive statistics (although still insufficient to do this estimate). It logically follows that all previous HDI estimates on Cuba’s economic indicator were even more invalid, as either there were no statistics or the existing ones were less reliable. In fact, the 1999 and 2000 Reports published a series of GDP p/c in US$ for 1975-1997/98 that included all Latin American countries but excluded Cuba (UNDP 1999: 152; 2000: 179). Finally, the estimate of an average GDP for the Caribbean as proxy for Cuba does not specify which countries were included and appears as an artifice. If Cuban economic data are not reliable, why was a rugged, unfeasible and unreal estimate of the GDP p/c PPP US$ and Cuba’s HDI world and regional ranks repeated for two years? We have discussed the deficiencies in the estimation of Cuba’s social and economic indicators. But that nation’s jump in the HDI ranking in 1997-1999 was essentially caused by a crucial change in the methodology used to estimate the economic index, which resulted in notable alterations in both the HDI values and the ranking of countries. For the entire period 1989-1999, Cuba was never in the HDI high group: Argentina, Chile, Costa Rica and Uruguay consistently ranked in the high group, while Mexico, Venezuela, Colombia, Panama and Brazil were in the high or medium group depending on the year.14 At the other end, Haiti was consistently in the low group, while Bolivia, Guatemala, Honduras, El Salvador and Nicaragua occasionally fell into that group or climbed to the medium group.15 Cuba, Ecuador, Paraguay, Peru and the Dominican Republic consistently ranked in the medium group. In 1989-1995, Cuba was below Venezuela, Panama, Mexico and Colombia and, in 1991-1994, also below Ecuador. With the miraculous jump of 1997- 1999, however, Cuba surpassed Ecuador and Brazil first, then Panama, Venezuela and Colombia, and finally, tied or surpassed Mexico. According to the 1999 tentative ranking, Cuba was in the upper edge of the medium group, only surpassed by the four countries in the high group. Next, we analyze the methodological change and its impact on the HDI and on Cuba’s rank. The estimation methodology of the GDP p/c PPP US$ index has been modified several times. In the 1994 to 1998 editions (1998 with information for 1995) the index was estimated with a formula that distinguished whether countries were below or above an income threshold that was the world average. Beginning with the 1999 edition (with information for 1997), the estimation formula was changed, and this affected the values of the HDI and the ranking of the countries.16 The 1999 Report stated in this regard: “Because of these changes, this year’s HDI is not comparable with last year’s. The improvements in methodology and data affect the HDI ranks of almost all countries … A drop or rise in rank could be attributed to the change in methodology or data” (UNDP 1999:129). This paper does not pass judgment on the merits or shortcomings of the new methodology, but only focuses on its impact on the estimates for Cuba. Assuming there were no changes in the two social indicators and as a result of the methodological change for the economic index, the countries with the highest GDP p/c PPP US$ (those in the high group) dropped in the economic index, and this negatively affected their HDI value and rank; countries in the medium-high group also fell in the economic index, as well as in the HDI value and rank. However, countries in the medium-middle, medium-low and low groups climbed in the economic index and the HDI value and rank. The HDI study done in Cuba concluded, after analyzing in detail the methodological change, that: “the new approach for treating income relatively favors, in the HDI estimate, the poorest countries, and penalizes the richest countries” (CIEM 2000:128; author’s translation). Cuba benefited from this change, since in 1995 it was in the medium-middle group and the new formula caused a rise in its GDP p/c PPP US$ index, its HDI value, and its world and regional rankings. The information for 1997 compared to that for 1995 (there are no data for 1996) shows that all Latin American countries increased their GDP p/c PPP US$ in absolute value, except Cuba, whose value stagnated, but ten countries declined in the corresponding economic index (i.e., the relative position of the countries vis-à-vis each other), while Cuba ascended. The four Latin American countries in the high group (Chile, Argentina, Uruguay and Costa Rica) considerably increased their GDP p/c PPP US$, but fell in the index, their HDI values and in their world rank, even though most of those countries also improved or maintained the level of their indices on the social indicators.17 The same occurred with regard to the four Latin American countries in the medium group (Venezuela, Panama, Mexico and Colombia). On the contrary, Cuba slightly fell in the life expectancy index, slightly rose in the education index (incorrectly, as we have seen), and did not change its absolute GDP p/c PPP US$ but had a significant jump in this index and considerably improved its HDI value, hence leaped from 85th to 56th in world rank. Because of this, Cuba leapt over Brazil and Ecuador, which had increased their absolute GDP p/c PPP US$ but had markedly fallen in their economic index. The opposite impact that the methodology change had on Brazil and Cuba is shown in Table 4, which compares—for 1995 and 1997—the three indices: health care (life expectancy, first column), education (literacy rates and enrollment in the three educational levels, second column), and economic (GDP p/c PPP US$, third column). To understand this table, three important aspects must be recalled: (1) indices interrelate all countries among each other (the best performer would score close to 1 and the worst close to 0); (2) each of the three indices contributes a third to the HDI value; and (3) the higher the HDI index, the better the country and the higher its rank. For instance, in 1997, the top performing country (Canada, 1st ) had a HDI index of 0.932 while the lowest country (Sierra Leone,174th ) had 0.254. The Report warned that the years 1995 and 1997 should not be compared due to the methodological change of the economic index and UNRO also cautioned against comparing indices of various years, but there are no standardized indices for Brazil and Cuba in 1995 and 1997. Table 4, albeit affected by the methodological shift, offers the only feasible comparison available, which indicates the differing effect of the methodological change in the ranking of the two countries. Comparing the health index in 1995 and 1997, Brazil improved (+0.01) and Cuba declined (-0.01), while in the education index both improved, Brazil slightly more (+0.03) than Cuba (+0.02). Therefore, in the two social indices, Brazil performed better than Cuba. In the economic index, however, Brazil notably declined (-0.24) while Cuba improved (+0.09), and these changes were the most important for the two countries. Brazil’s drop and Cuba’s rise in the economic index, however, are at odds with their absolute value, which is shown in the last column of Table 4: Brazil’s GDP p/c PPP US$ increased 9% (from 5,928 to 6,480) while Cuba’s remained the same (3,100 for both years). Therefore, the methodology change in the estimate of the economic index determined that Brazil’s HDI value declined (-0.07) while Cuba’s increased (+0.04). At the same time, this resulted in a drop of 17 positions in the world ranking of Brazil (from 62nd to 79th place) and a jump of 27 positions for Cuba (from 85th to 58th place), as well as in an inversion in their position in Latin America: Brazil fell from 9th to 11th place, while Cuba leaped from 11th to 9th. The HDI study done in Cuba offers a serious and comprehensive analysis of the impact of the methodological change in the economic index on the ranking of the Latin America and Caribbean countries, separating such change from the effects that variations in other indicators may have had. That study concludes: “Cuba presents the largest positive difference (26 positions), exclusively explained by the change in the methodology to estimate the income” (CIEM 2000:128; author’s translation). In other words, Cuba’s jump from 85th to 58th place (the largest among 33 countries) was solely the result of the methodological change. Conversely, Brazil fell 17 points in the HDI ranking, and the Cuban study estimates that its descent from 62nd to 79th place occurred in spite of improvements in the social indicators, so that the methodology change was responsible for the drop of 19 positions (CIEM 2000:134).18 The 1999 Report acknowledges that Cuba’s improvement of 26 points and Brazil’s decline of 19 points were “rank changes due to the refined methodology” (UNDP 1999: 165). In 1998, the crises in Asia, Russia and other emerging economies, negatively affected economic growth in Latin America, and the vast majority of countries in the region suffered a decline in GDP p/c PPP US$, its index, the HDI values and the world rank. This happened in Panama, Venezuela and Colombia, countries that for many years were above Cuba in the HDI. Cuba, however, was one of the few countries that, according to the 2000 edition of the Report, experienced growth of its GDP p/c PPP US$—28% growth—a true miracle, particularly if we take into account that, according to official data, GDP p/c increased only 0.8% (ONE 2001). Due to this anomaly, Cuba ascended in the economic index, the HDI value and its world rank, surpassing the three Latin American countries mentioned above. In the 2001 edition of the Report, although Cuba did not have a precise rank, it ascended even higher (the website version of the Report showed Cuba’s position between the 50th and 51st places in the world), tying or leaving behind Mexico. This paper demonstrates that the HDI estimate for Cuba in 1989-1999, as well as Cuba’s rank in the world and Latin America, have been flawed for the following reasons: (1) the health indicator was based on a series on life expectancy that is inconsistent and contradictory; (2) the education indicator showed an ascending gross enrollment rate when its three components (i.e., educational levels) showed enrollments lower in 1991-1999 than in 1989; (3) the economic indicator was estimated despite the lack of the essential statistics, using spurious sources and, more recently, based on an inappropriate Caribbean average (the HDI estimated a GDP p/c PPP US$ increase of 69% in 1989-1999, while Cuban official GDP p/c adjusted for inflation and converted to US$ based on the official exchange rate decreased 29%); and (4) the methodological change for the estimation of the economic index in 1997 was solely responsible of Cuba’s rise of 26 positions in the world ranking, even though in that year it was the only country in Latin America with a stagnant GDP p/c PPP US$ (for 1998, the HDI estimated a 28% growth in the GDP p/c PPP US$ even though the official GDP p/c adjusted for inflation increased only 0.8%). The flawed data and methodology result in indexes that show Cuba surpassing Panama, Venezuela, Colombia and Brazil in the HDI ranking, countries that for many years were above Cuba in the world and regional rankings. In 2001 the Report excluded Cuba from the HDI, acknowledging that it does not offer reliable data and that its GDP p/c PPP US$ is not available. Despite of this, the Report estimated Cuba’s GDP p/c PPP US$ in 1999 (based on the Caribbean average) and raised Cuba in the ranking again, placing at the same level or above Mexico, and close to the upper edge of the medium group, only surpassed by the four countries in the high group. The UNDP intends in the future “to include all UN member countries in the HDI exercise” (2001a:136). The HDRO (2002) made an effort, for the Report 2001 edition (joining forces with the World Bank and the University of Pennsylvania), to estimate Cuban GDP p/c PPP US$ but “it proved extremely difficult” and was unsuccessful. And yet HDRO reports that for 2002 “we are again using our own estimate,” which can be interpreted as repeating the faulty Caribbean average approach. It is my hope that this paper makes UNDP officials more aware of the problems in Cuba’s social indicators and helps to correct them. It would be advisable also to suspend the publication of all estimates of Cuba’s GDP p/c PPP US$ until the necessary and reliable data become available. Last but not least, until those problems are solved, Cuba’s HDI should not be calculated and that nation should not ranked within the world and within Latin America. 1. The author gratefully acknowledges valuable comments on a preliminary version of this paper from Sergio Díaz-Briquets, Manuel Madrid-Aris, Manuel Pastor Jr., Jorge Pérez-López, and the Human Development Report Office in New York, as well as in the editing of the final version by Jorge Perez-López. In addition, Kristin Kleinjans helped in the evaluation of the methodological change in the economic index, and Jorge Gorostiaga in the formatting of the final version of the paper. The author is only responsible for what is said herein. 2. Nevertheless, ECLAC published for many years Cuban GSP comparing it with GDP in the rest of the region. Only a footnote in fine print warned that the Cuban figure was GSP, without any explanation of the implications of using one concept or the other. 3. The first edition of the Report, published in 1990 with figures for 1985-1988, ranked the countries from lower to higher level of human development, while the second edition, published in 1991 with figures for 1980-1990, inverted the ranking from higher to lower level of human development, and also introduced other changes. The third edition used more standardized figures (1989-1990) and the following editions standardized all the figures in the same year. As this paper analyzes the changes for Cuba on the eve of and during the 1990 crisis, its tables start with the third edition of the Report. 4. Until 1998 there was a gap of three years between the publication of the HDI and the information used. Starting with the 1999 edition, that gap was reduced to two years, which led to the elimination of the year 1996. 5. A study of the HDI conducted in Cuba gives a life expectancy of 74.7 in 1998 (CIEM 2001:146) compared to 75.8 given by the HDI (UNDP 2000). 6. In fact, in 1970-1985 the percentage exceeded 100% since there was not a perfect matching between enrollment and school-age population at the primary level (UNESCO 2001). 7. A study of the HDI done in Cuba acknowledges that “the secondary level is the most problematic of the Cuban educational system” and there was “a slight decline in the 1993-94 and 1994-95 years, but recovered in the following two years” (CIEM 2000: 82; author’s translation). However, the 1989 level had not been recovered by 1997. 8. It is not possible to compare HDI and Cuba/UNESCO figures because the Report of the HDI does not publish gross enrollment rates separately but the combined rate of the three levels. The study of the HDI done in Cuba does not offer separate series of those rates, either, but only the rates of two levels for a year (CIEM 2000). 9. ECLAC’s recently-released note on Cuba for 2001 (ECLAC 2002) published GDP at constant prices of 1997, but only for 2001, making impossible to connect that year with the previous series at 1981 prices. 10. Another anomaly in the HDI comparison is the change in rank: in the year 1995 Cuba was ranked in the 85th place and in the year 1997 was ranked in 58th place, for an improvement of 27 positions, but the 1999 Report gave an improvement of 26 positions (UNDP 1999: 165). 11. It should be noted that the 1990-1996 Cuban figures were not published until 1998, because Cuba’s statistical yearbook (Anuario Estadístico de Cuba) suspended its publication in 1991 (the 1989 issue) and did not resume it until 1998 (CCE 1991 and ONE 1998). Therefore, the 1992-1997 editions of the Report, which gave figures for the years 1990-1994, did not have available published Cuban data for those years. 12. The complete citation is Robert Summers and Alan Heston, “Penn World Tables (Mark 5): An Expanded Set of International Comparisons, 1950-1988,” Quarterly Journal of Economics, 106 (1991): 327-368. 13. The World Bank, World Atlas 1996 (Washington D.C., 1996:19) gave a range from 726 to 2,895 for Cuba in 1994, and the HDI estimated 3,000. The World Atlas 1997 (Washington D.C., 1997: 36-37) gave a range from 766 to 3,035 for Cuba in 1995, and the HDI estimated 3,100. In both cases the HDI estimate was higher than the higher figure of the World Bank’s range for Cuban GDP p/c PPP US$. 14. In 1989-1995, when the high group was expanded in the HDI, but not in 1997-1999, when that group was considerably reduced. 15. In 1989-1990, when that group was larger. 16. This is a technical and complex aspect that cannot be analyzed in this article. With the 1994-1998 formula, if the GDP p/c PPP US$ of a country was below the average threshold, it was not adjusted. If it was above the average, it was adjusted with a discount. As income rose, the adjustment and the discount increased. Beginning with the 1999 edition (data from 1997 on), the threshold was eliminated, an income logarithm was used, and the discount decreased. For the differences between the two formulas see UNDP 1998: 107, and UNDP 1999: 127-130. 17. Surprisingly, life expectancy at birth in 1995-1997 slightly declined in Chile, and a little bit more in Costa Rica, apparently due to a revision of previous estimates, but all the information available for both countries confirms that their life expectancy showed an increasing rise in 1980-2000 (ECLAC 2001a:12-13). 18. It should be noted that the CIEM study defends Cuba’s advances, criticizes the HDI methodology and proposes to replace it with a new Index of Human Development and Equity, in which Cuba would rank second among 23 countries of Latin America and the Caribbean.